Today I was very pleased with my outfit. It was kinda thrown together nice a quick as I rushed through my morning routine so I wouldn’t be late to work. It felt very me. I bled my very essence in my clothes today. Which was a very nice feeling. I don’t have a definite style or a definite fashion sense. Some days I’m chic, some days I’m hipster, some days I’m girly, some days I’m a hobo. But if I were to explain my fashion sense I tell them: a mixture of the hipster style with the Japanese girl aesthetic that lives for flowers. It really doesn’t make sense to be honest. But today it yelled: Wanna be flower bookworm! (Queen). 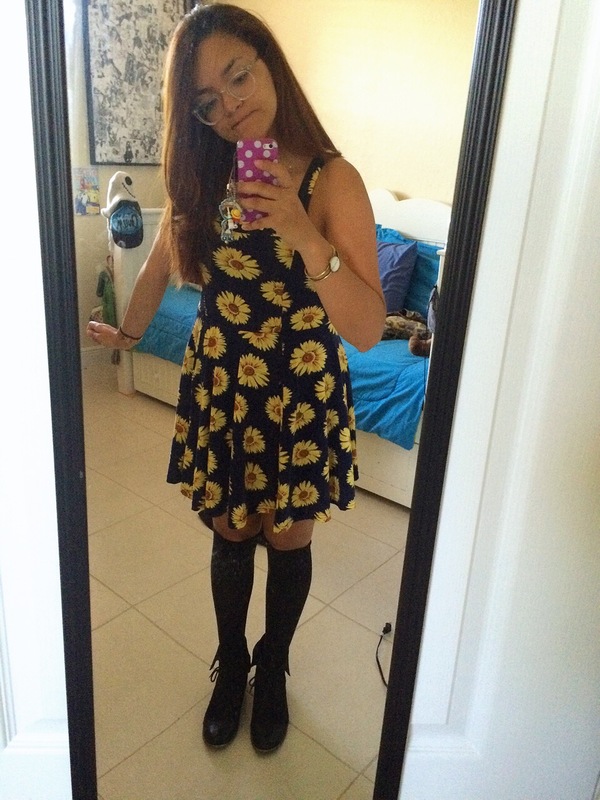 A skater dress, jumper, knee highs and boots. The jumper is from a Harry Potter themed store called Whimsic Alley. I came across this Quidditch jumper at Geekycon. And I had to have it…even though I am not a Gryffidor. 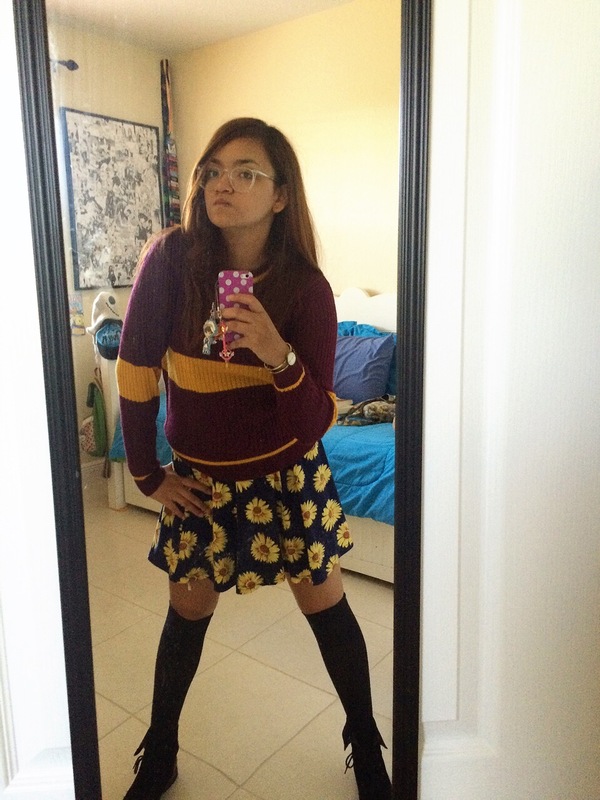 I felt bad, a Ravenclaw purchasing a Gryffidor Quidditch jumper! (Don’t tell JKR) in my defense! The Ravenclaw colours didn’t look good on me because 1) it was movie colours and 2) it was light blue rather than navy blue. Red looks so much nice against my skin tone. The socks came from sock store in Japan. It was 350 yen which would be about 3 USD. These are also “slimming” socks, that helps your legs become slimmer. (Japan is strange). Now my boots I’ve owned since I was 14…so 6 years. I honestly don’t remember where I got them. Could be Forever 21 or some other store with the same style. Now my favorite piece of the whole “I love Harry Potter, flowers and my style” outfit is the bracelet on my right wrist. It is a book quote, but a very important one. It is the last words written in the last book of the Harry Potter series. 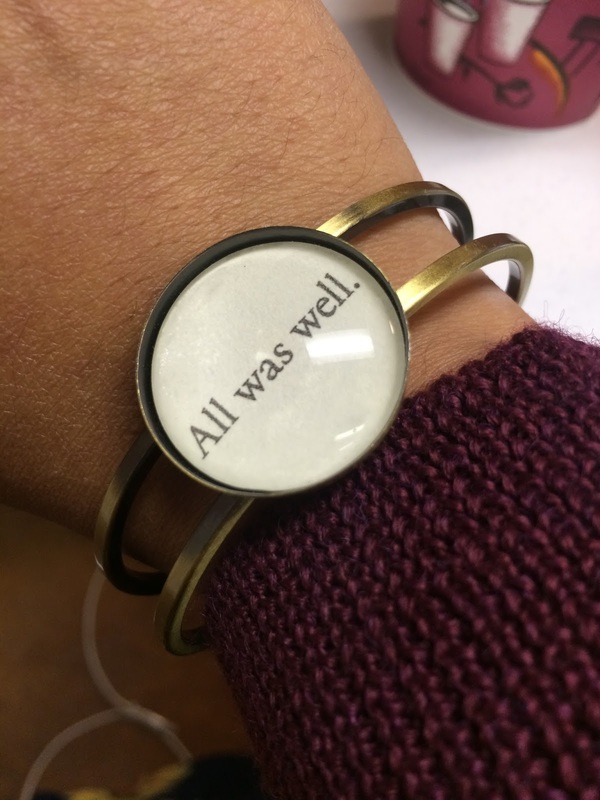 “As was well”. This bracelet is hand-made and came from a cute little shop called Little Shop of Hodge Podge. They get old damage books and give them new purpose. I feel so delighted that now I can carry a bit of Harry Potter with me where I go. They all sorts of books as well as designs so I plan on purchasing more book jewelry from them soon!